HFC(High Frequency Connector)comply with SAE/USCAR-2, 17, 19. 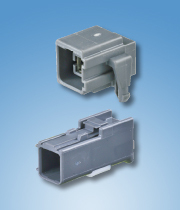 HFC is connector that connect on-board multimedia devices, such as TPMS, GPS, TV, VICS and etc., and coaxial wires. These are also suitable for mobile telephone and sensor circuit. - It reduces reflection/transmission loss and restraints noise radiation. - TPA for secondary lock is assembled beforehand. - Compaly with USCAR-19 key-k footprint.